Tribal Meeting - Saturday, April 20, 2019 at the Mountain Ranch Community Club, 8049 Washington, St., Mountain Ranch CA starting at 12:30. Food is pot-luck. 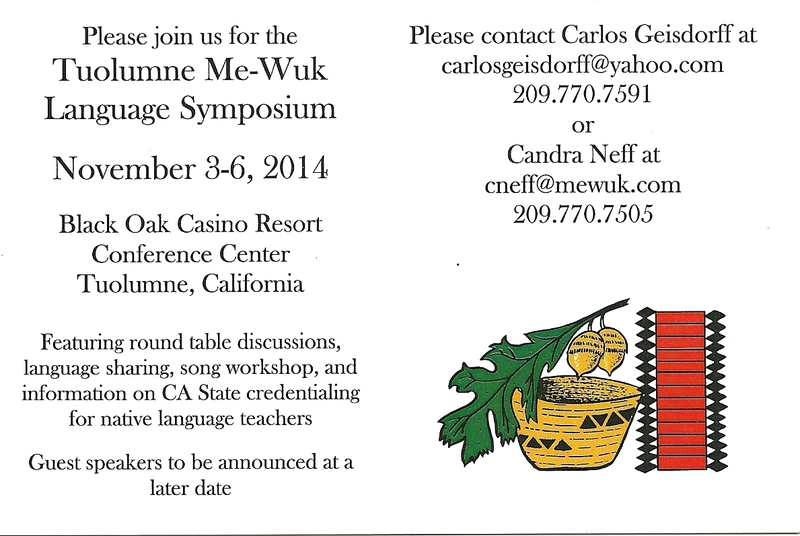 Language Symposium - November 7 to 9, 2018 Annual All MeWuk Language Symposium at the Black Oak Conference Center. In Memoriam - On August 16, 2018 Tribal Elder, Charles Edward Wilson passed away. In Memoriam - On December 12, Yakima Dixie passed away. Services will be held on December 30. Current Litigation - Burley looses in cases against the Federal government and Everone. In memoriam - Antone Azevedo, Jr.
Calaveras Miwok Celebration - August 14-16, 2015. Free camping Friday through Saturday. Dinner at about 2 p.m. on Saturday. Bring side dishes, salads, fruits (main dishes are provided). Sourgrass (Wakaluu Hep Yoo (Wild River) Campground) area campgrounds are located on the banks of the North Fork of the Stanislaus River, several miles south of Dorrington.